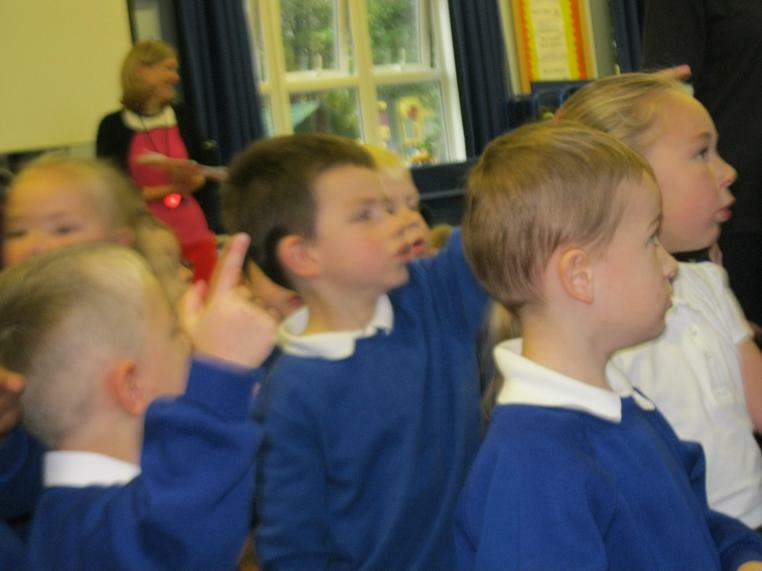 On the 21st October we celebrated our annual Harvest Festival. 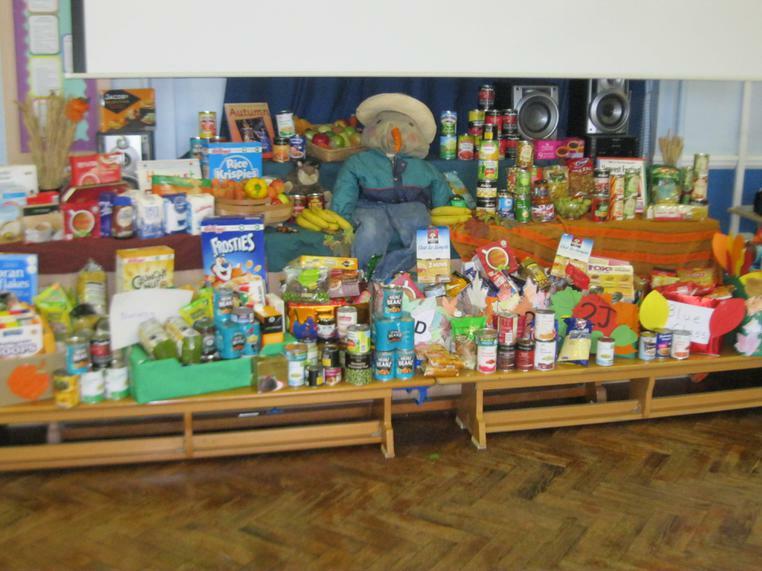 Children across the school generously brought in food and toiletry items to share with those who were less fortunate. 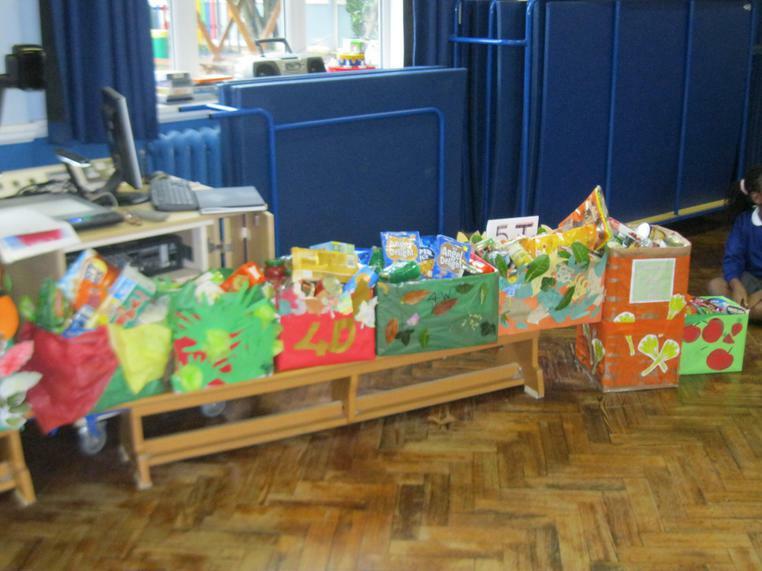 Boxes were made up by each of the classes and shared with the children in assembly. 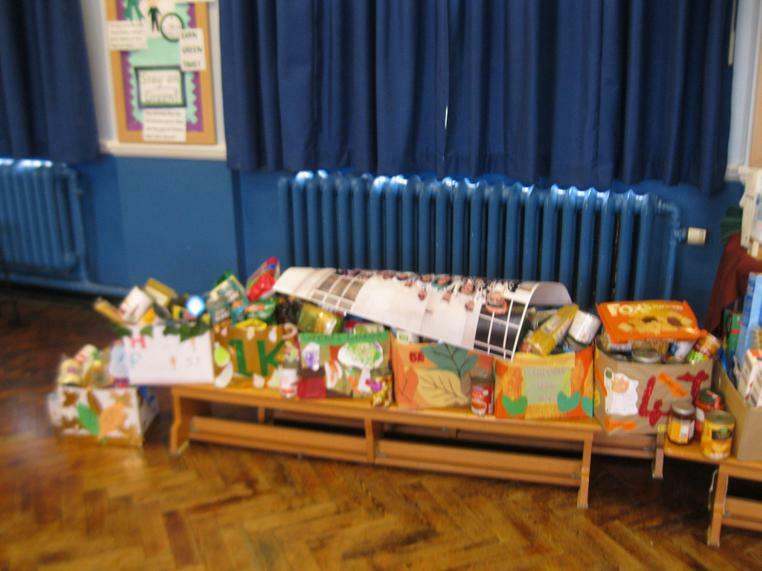 These boxes were then collected by a local charity 'Mark McCarphy's Magic Moments' who provide hampers for people suffering from cancer or who are terminally ill.
To mark Harvest, children across the school prepared performances to share with visitors and the school. 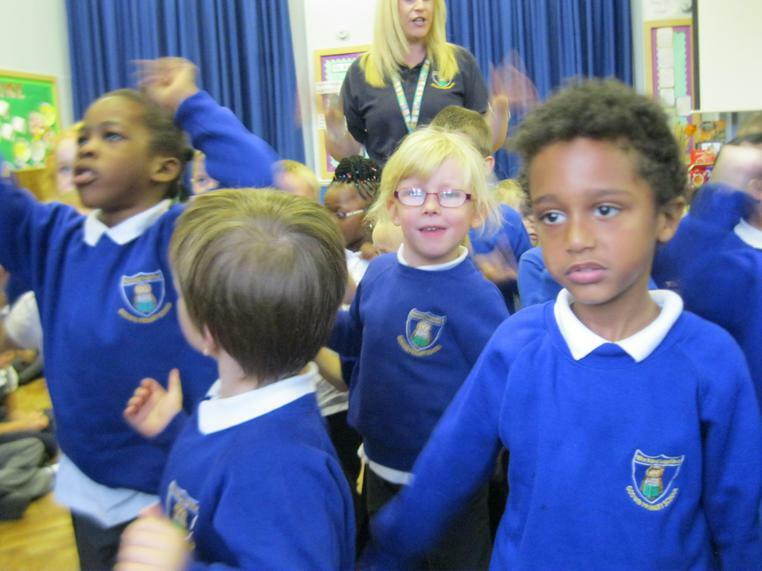 In KS1 we were treated to songs from Reception, Year 1 and Year 2. 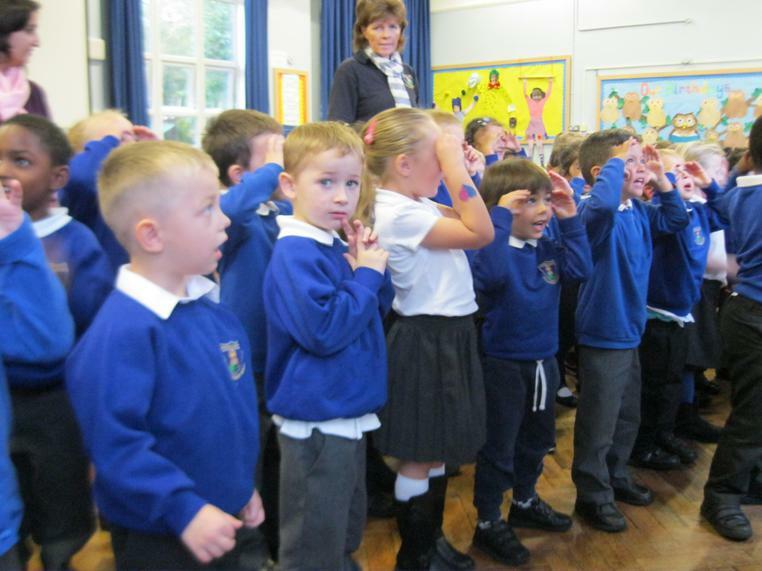 Reception sung 2 songs - 'The Owl' which reminded us of our school logo, and 'The Scarecrow'. 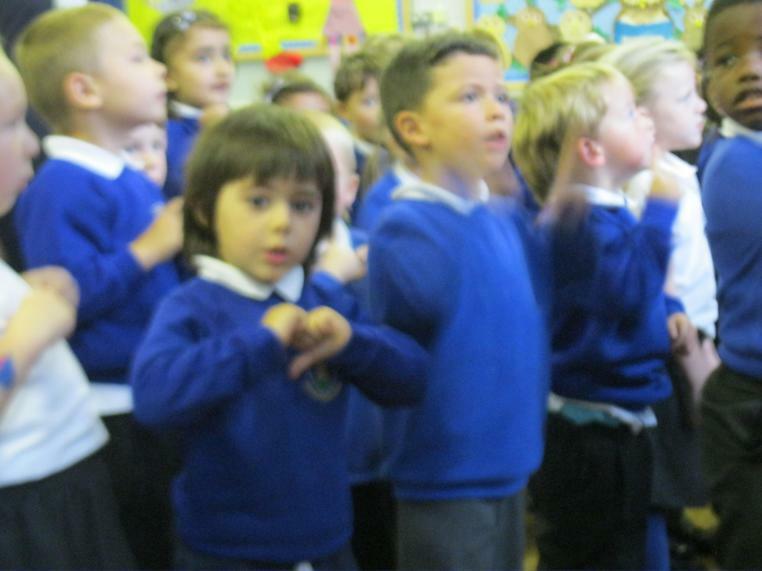 They performed and danced with big smiles, and it was hard to believe that they have only been in school full time for 4 weeks. 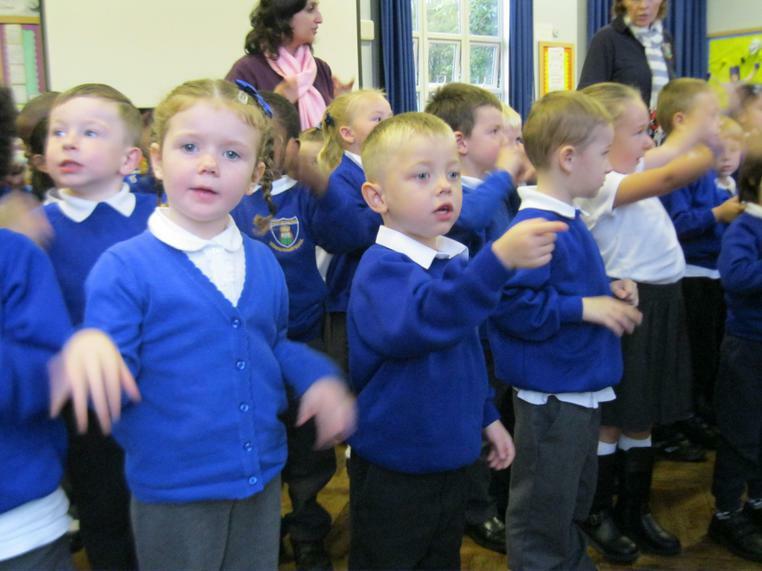 Year 1 followed with a mischievous song '1, 2, 3 little acorns' with a squirrel searching for their acorns. 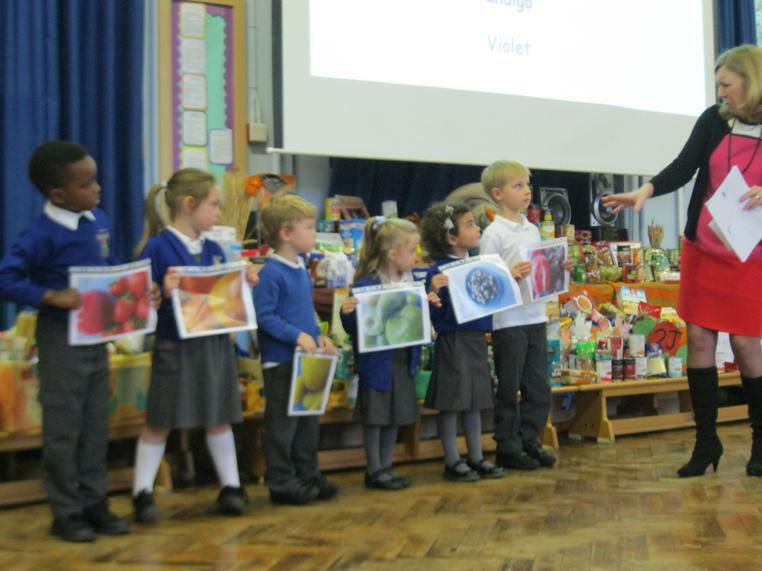 The performances ended with Year 2 singing 'Vegetables and fruit' where they told us all about the healthiness of fruit and vegetables, and to leave unhealthy snacks alone. The line 'Yummy, yummy, yummy in my tummy' was a particular favourite. 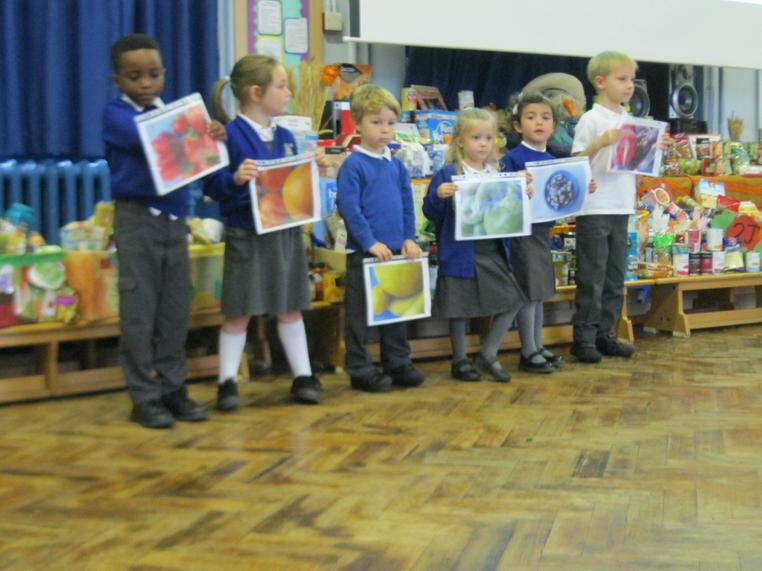 Mrs Phillips then spoke to the children about the 'Rainbow' Harvest - matching the colours of the rainbow to different fruit and vegetables. 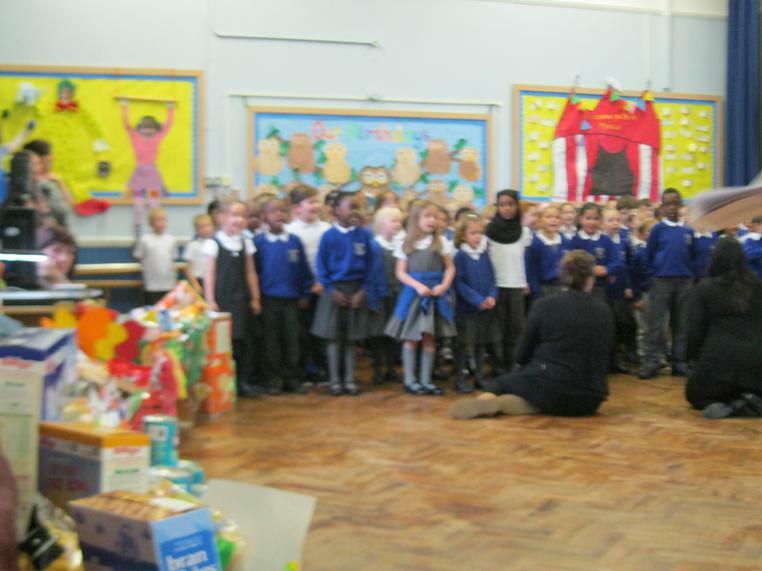 KS2 started with Year 3 singing the poignant song 'Harvest for the World'. This started with an unaccompanied 2 verses before the music kicked in. 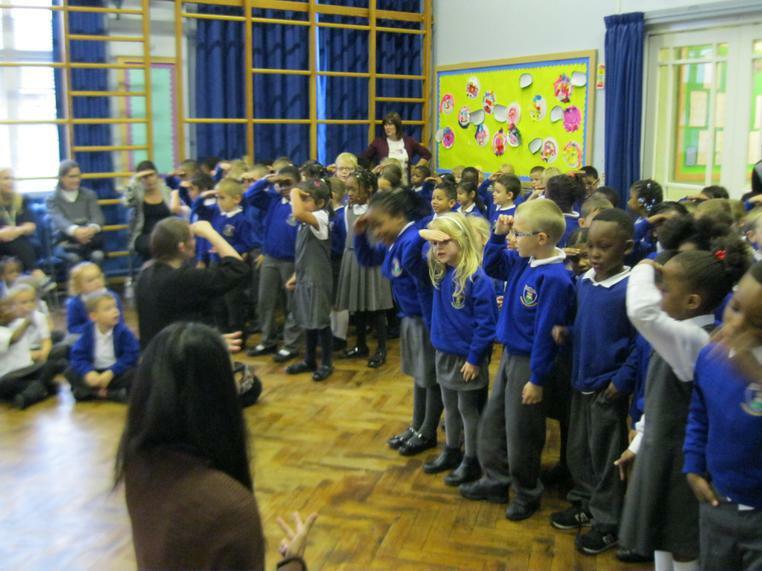 Year 4 followed with an unaccompanied version of Miss Spooner's favourite Harvest song 'Autumn Days'. 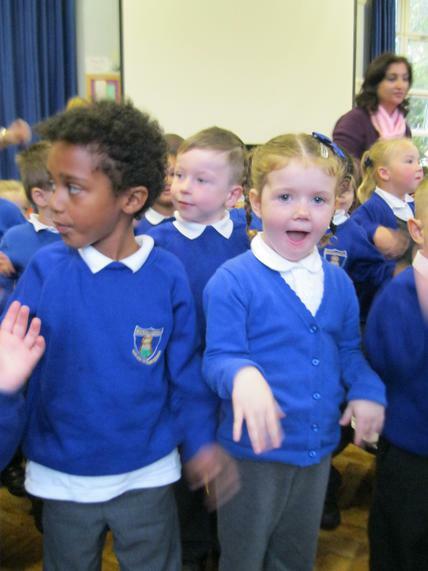 This was swiftly followed by Year 5 with Miss Ewington's traditional 'Harvest Samba'. Having learnt off by heart Henry Birtles' 'The Harvest', Year 6 treated us to a unique and polished poetry performance. 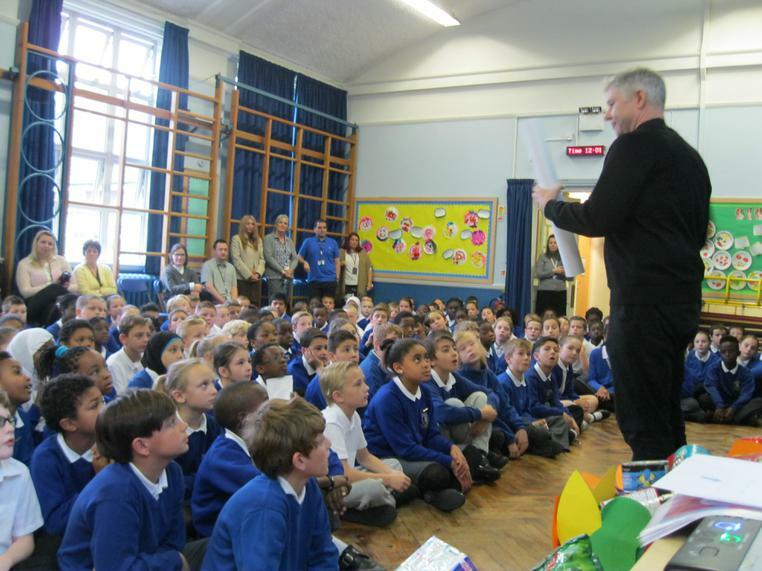 This poem had been performed during the 2013 Westminster Abbey Harvest Festival, and it was good to see our children performing something so iconic with clarity, volume and meaning. 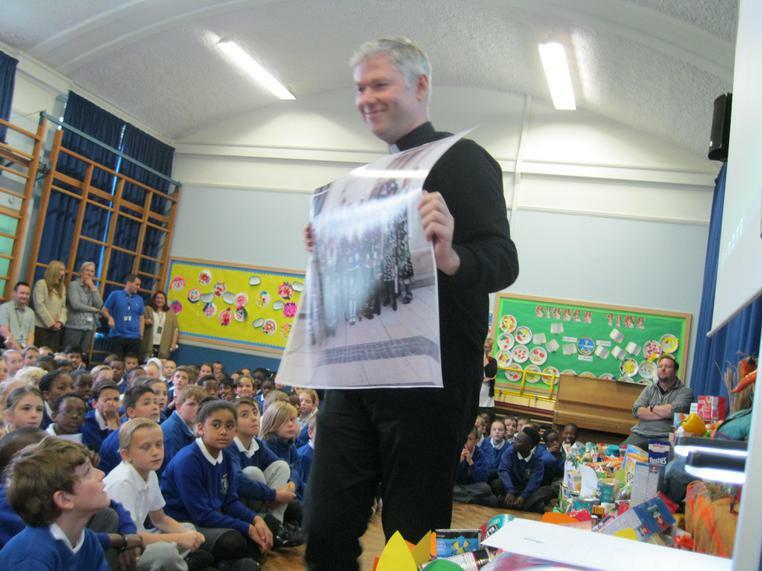 KS2 assembly concluded with Reverend Mark, from St Albans church, telling the children all about the history of the Pearly Kings and Queens, and how this linked with harvest - giving both the children and staff a link to the history of East London. 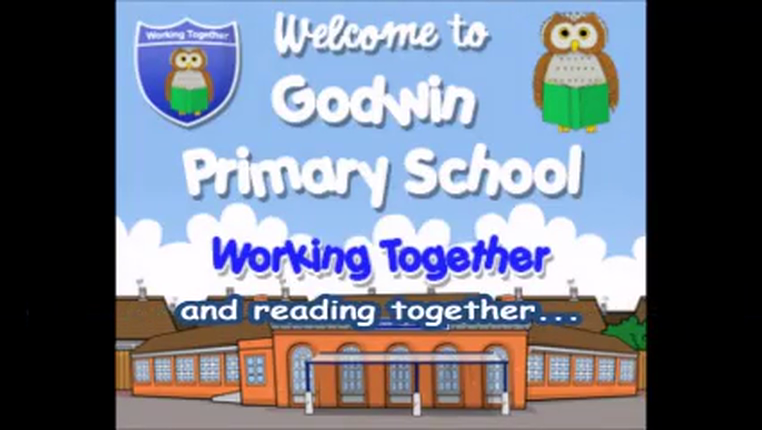 All the visitors, that included the Reverend, Governors, former staff and friends of Godwin, commented on the children's performances, generosity and smart appearances.